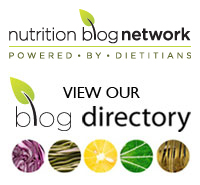 There was a great deal of excitement here on Monday with the announcement that Health Canada is proposing real change on the nutrition labelling front. Before talking about the changes, it’s important to recognize that these are only proposed changes. The government has launched a series of online public consultations to get input from various sources. This means nothing is carved in stone yet and consumers need to make their voices heard. You can bet that the food industry certainly will put in their two cents. You can go online and voice your opinion about the need for these changes. Click on the Participate Now button. Changes to the Nutrition Facts box and ingredient lists, ones that have long been called for, may certainly make shopping for healthy eats easier. With the current labelling system, it often seems that you need to be either a biology expert or a math whiz to get through the supermarket aisles in a timely manner. Take a look at some of the proposed changes dealing with sugar. 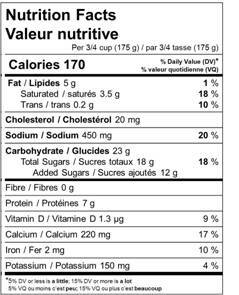 To help you make an informed choice, not only will there be changes to how sugar is listed in the ingredient list but there will now be a line for “Added Sugars” in the Nutrition Facts box. Currently, all sugar-based ingredients added directly to a food are listed separately in the list of ingredients and in descending order based on their proportion by weight to the food. Health Canada is proposing that all ingredients that are a type of sugar (for example: sugar, glucose-fructose, honey, fancy molasses) be grouped in parentheses after the common name “Sugars” and be placed in the list based on the total contribution of the sugar-based ingredients to the food as illustrated below. The Added Sugars line will finally help consumers to separate the amount of natural sugars in foods such as yogurt or cereal versus those sugars added. There has been confusion, though, in the reporting of what this actually means when it comes to those added sugars, such as fruit juice concentrates, that have been masquerading as a healthier alternative to table sugar. In other words, fruit juice concentrates that are added to food products as sweetening agents will be declared as added sugar. As a result, the healthwashing carried out by products such as Dare Real Fruit Gummies will come to an end. But there is an area that Health Canada needs to rethink. They are have come up with a figure for the % Daily Value – the total amount of sugars we should be aiming for. The figure is 100 grams (25 teaspoons) per day, but also includes natural sugars in food. Is this meant to discourage you from eating foods such as berries, mangoes and plain yogurt or milk where these natural sugars are found along with a bounty of other nutrients? Shouldn’t the new labels also single out “added sugars” here? Why not have a % DV for added sugar that goes along with what the World Health Organization (WHO) says we should aim for? Previously WHO has stated that 10 % of daily calories or 50 grams of sugar was the goal. Now they are looking to revise this in half – to 25 grams. If you agree or disagree with any of the proposed changes, please click on the link and take the survey. Will you let Health Canada know how you feel about the proposed changes? Please share your thoughts in the comment section below. ← Moldy food facts: a little mold can’t hurt you – or can it?